To the uninitiated, this is a toughy to like. Even to the initiated, it’s pretty scary. But I’ve grown to like Myeolchi Bokkeum on a steaming bowl of white rice. It’s also good in kimbap and bibimbap. It’s the brininess of the sea with a little sweet and heat. Here is how Eun Jeong makes it. 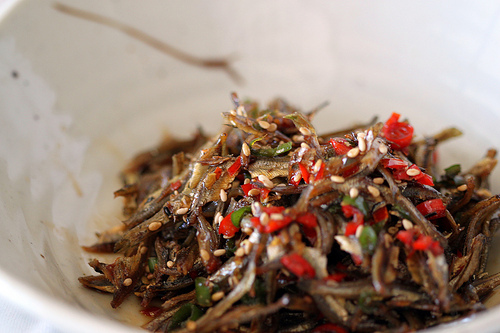 For her recipe, we use the medium sized dried anchovies. You can find them at your local Asian or Korean grocery. Since these are a little sizable, they need to be cleaned. See that nasty looking poopy stuff? Remove it. Toss it away. 1. Toast the anchovies in a dry pan to bring out their flavors and reduce their fishiness. 2. Add oil and stir-fry the anchovies on high heat. 3. Add the peppers. Careful, the house will smell like Gwangju in the ’80s. After a minute or so of stir-frying, turn off the heat. 4. In a saucepan, combine the liquids and taste. Adjust so that it’s a perfect balance of sweet and salty. Err on the sweet side if you must. Boil until it’s reduced to a sauce. 5. Add the anchovies and peppers. 6. Add the sesame seeds and stir-fry for another minute. Plate and garnish with more sesame seeds. If you don’t have an open mind, the idea of sweet tasting fish dishes is unsettling. But the finished product should not taste too fishy, more like spicy kettle corn. First time I saw these I was like no way! But now I dig right in.